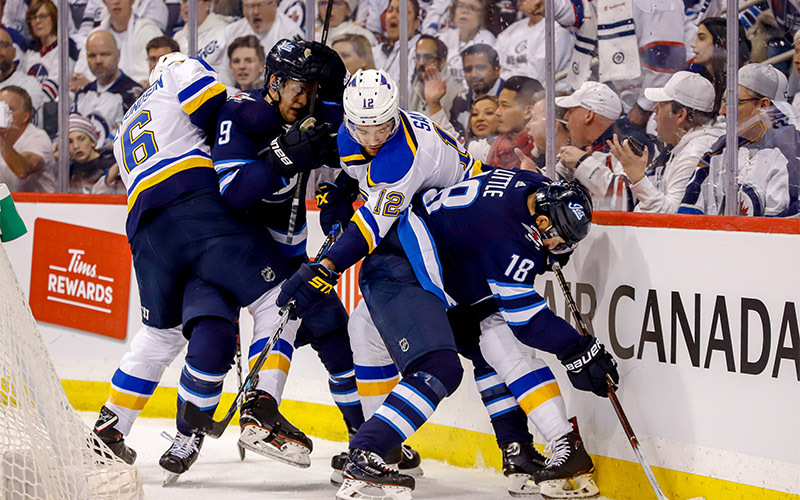 The Winnipeg Jets are on the road tonight for the first time in the 2019 Stanley Cup Playoffs, as they visit the St. Louis Blues in Game 3 of their Western Conference First Round playoff series…The Jets lost the first two games at home, losing Game 1 on Wednesday 2-1 and Game 2 on Friday 4-3…Game 4 of the series is slated for Tuesday in St. Louis, while Game 5, if necessary, is scheduled for Thursday back in Winnipeg at Bell MTS Place. The Jets lost the first two games of the series by one goal and are 1-10 all-time as a franchise in playoff games decided by one-goal…Winnipeg was 1-4 in one-goal games during their playoff run last season…During the regular season, the Jets went 19-7-5 in one-goal games, which was sixth-best in the NHL. The Jets are the only team in the playoffs that hasn’t scored a goal in the third period…Winnipeg finished fifth in the NHL during the regular season with 102 third-period goals, which was their most productive period. The Jets went 22-18-1 on the road during the regular season, which set a franchise record for the most road wins in a season…Winnipeg went 4-2-1 in their last seven road games…The Jets won both games against the Blues in St. Louis during the regular season and are 8-2-0 in their past 10 games in St. Louis…Blake Wheeler led the Jets in scoring on the road during the regular season with 40 points (10G, 30A) in 41 games. Jets head coach Paul Maurice is coaching in the postseason for the seventh time in his career…Maurice is 34-42 behind the bench in playoff games, with the highlight of his postseason success coming in 2002 when he coached the Carolina Hurricanes to the Stanley Cup final…The nine playoff wins the Jets posted last season is the second most Maurice has had in a playoff run, next to the 2002 season. Patrik Laine has scored in both games of the series so far…He has 15 goals in 14 career regular season and playoff games against St. Louis, including eight goals in six games this season…Laine set a franchise record with five goals against the Blues on Nov. 24…He has 11 goals in seven career games at Enterprise Center and has scored in six of the seven games.